Have you experienced the ever dreaded moment of coming home from a desperately needed evening out of the house only to find that your precious, expensive, fluffy cloth diapers have been ruined due to improper washing? It doesn't have to happen to you (again)! Parents, grandparents, and caregivers alike will love this handy wash instruction magnet that sticks right on your washing machine. It will serve as a handy reminder of how to keep your diapers soft, fluffy and absorbent. This .020 mil thick vinyl magnet measures 3.75" H by 3" W and is proudly made in the USA. 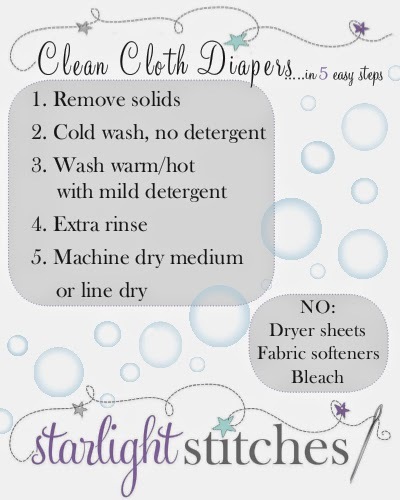 Our Cloth Diaper Wash Instruction Magnet is perfect to have on the washing machine when you are leaving the kiddos with grandparents and sitters (or when your exhausted baby brain just needs a reminder). They also make a great gift for new moms or those new to cloth diapers! Ready to buy? Click HERE!